Involved in vesicular protein trafficking. Mainly functions in the early secretory pathway but also in post-Golgi membranes. Thought to act as cargo receptor at the lumenal side for incorporation of secretory cargo molecules into transport vesicles and to be involved in vesicle coat formation at the cytoplasmic side. In COPII vesicle-mediated anterograde transport involved in the transport of GPI-anchored proteins and proposed to act together with TMED10 as their cargo receptor; the function specifically implies SEC24C and SEC24D of the COPII vesicle coat and lipid raft-like microdomains of the ER. Recognizes GPI anchors structural remodeled in the ER by PGAP1 and MPPE1. In COPI vesicle-mediated retrograde transport inhibits the GTPase-activating activity of ARFGAP1 towards ARF1 thus preventing immature uncoating and allowing cargo selection to take place. Involved in trafficking of G protein-coupled receptors (GPCRs). Regulates F2RL1, OPRM1 and P2RY4 exocytic trafficking from the Golgi to the plasma membrane thus contributing to receptor resensitization. Facilitates CASR maturation and stabilization in the early secretory pathway and increases CASR plasma membrane targeting. Proposed to be involved in organization of intracellular membranes such as the maintenance of the Golgi apparatus. May also play a role in the biosynthesis of secreted cargo such as eventual processing. Sample (30 ug of whole cell lysate). A: Raji. 12% SDS PAGE. TA308994 diluted at 1:1000. 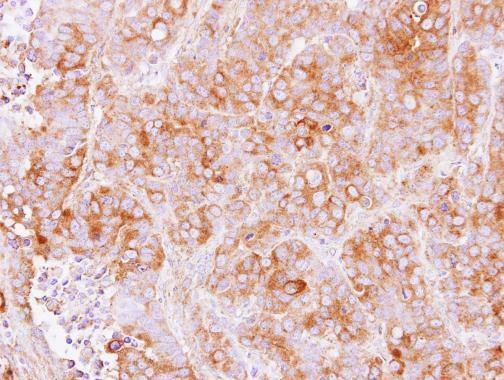 Immunohistochemical analysis of paraffin-embedded MCF7 xenograft, using TMED2(TA308994) antibody at 1:500 dilution.